This post is sponsored by Command™ Brand. All opinions and additional product selections are my own! 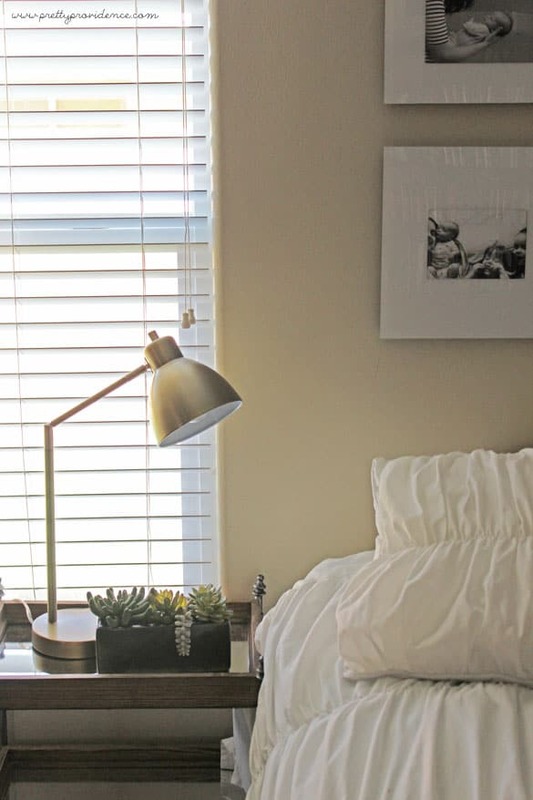 Please tell me I am not the only person whose master bedroom is their most neglected room in their house! Maybe it’s because no one but Bryce and I ever go in there, or maybe it’s because master bedroom furnishings can be so expensive, or maybe it’s simply that we haven’t gotten there yet, but my master bedroom was in a sad, sad state. We have been thinking about listing our house to sell for awhile now, and as that became a reality it finally pushed me to do something about the master situation. I took a little bit of money and spent a couple hours and I feel like our room is completely transformed. I’ve been kicking myself for waiting as long as I did, it’s amazing how a little can go a long way in terms of making a space feel homey and inviting! Read on for lots more photos, sources and a few tips! I have my heart set on a four poster bed, and that is just not in the budget right now, but I knew I needed some kind of statement over the bed in place of a headboard.. enter Command Decor Damage Free Wall Tiles! You guys may remember from this post on how to hang a gallery wall without nails but I am basically obsessed with Command strips, and these wall frames take it to the next level! To be able to hang and switch out pictures with no real measuring, no nails and absolute ease? Oh and did I mention they have a built in level, too? I’m kinda obsessed, you guys (video tutorial here, if you’re interested). 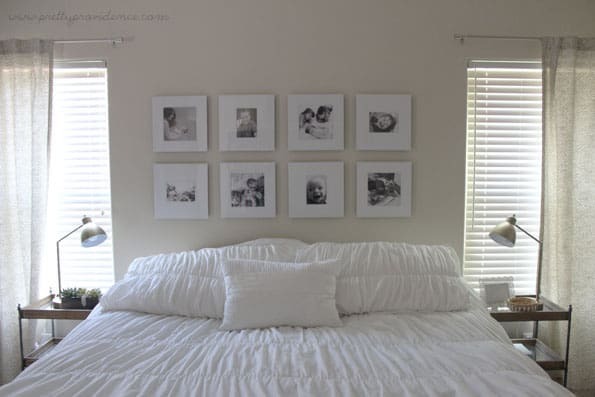 If you are gonna try this out, remember to scoot your bed out just a few inches from the wall, so that the frames aren’t hanging directly over the bed! Anyway, I have been wanting to do a little instagram wall gallery somewhere in my house for awhile now so I thought this would be the perfect place. I swear we barely make it through the day sometimes, and then as soon as everyone’s in bed I miss my kids and scroll through instagram laughing at all their pictures, haha! So this spot seemed appropriate. 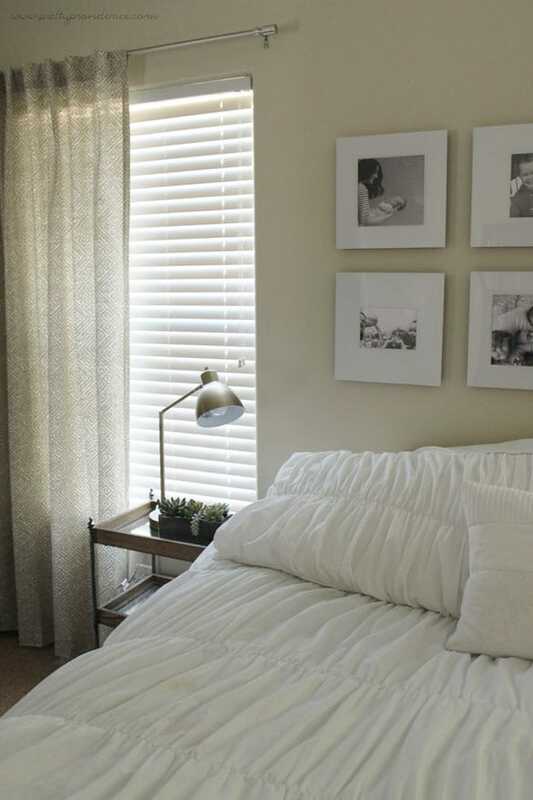 Can we talk about what a difference curtains make in a room? I mean seriously, such a statement (check out this post for tips on how to appropriately hang curtains)! Especially when you find awesome ones like these geometric beauties I got at Target. What would we do without Target? Seriously? The simple metal rods were from Target as well. I couldn’t find either of the links online though :( sorry friends! I totally love the slick glassy modern look of these wall frames (although it is hard to photograph) they work perfect with the gallery vibe I was going for. I chose four square openings and four 5×7 openings going different directions to add interest, but I kept all the photos black and white for a cohesive look, since varying colors in candid photos would be really busy. This way all the photos match and I can switch photos in and out easily as I feel like it! 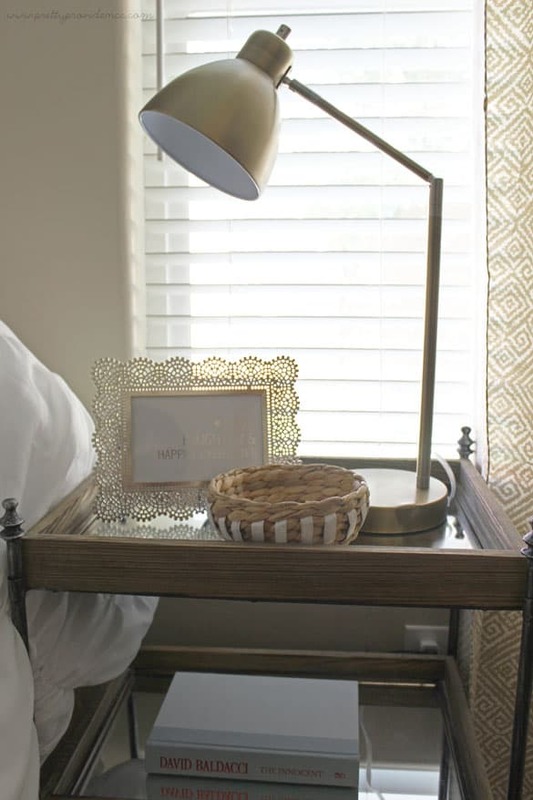 Okay, can we also all swoon over those gold desk lamps!!! Oh my gosh I was giddy when I found them and they were only $24.99 a piece! I found them at my local Target but they aren’t online either :(. Here is a similar version on Amazon. The cute succulents are also from Target! I already had the white bedding, and I got it for a steal on Wayfair way back when. The awesome side tables are little carts I found at TJMaxx for $79.99 a piece! They add such a statement and I love the mirror/metal/glass combo. I am big into mixing metals lately so I love How we have gold, silver, pewter and glass all in one little corner. Threw in the cute little basket to add some texture but its also great for holding tissues, chapstick or whatever it is you keep on your nightstands! The frame and the basket were TJMaxx clearance! Well there you have it! It’s obviously not completely finished but it feels so much more warm and inviting. I smile every time I open my door lately, I love that surprised happy “oh yeah! I like my room now!” feeling. The best part is, once I am able to get my four poster, I can still keep everything else the same! I just have to move the photos up a tiny bit, and as I said before, the tiles are totally painless to adjust! So there you have it! What do you think?! 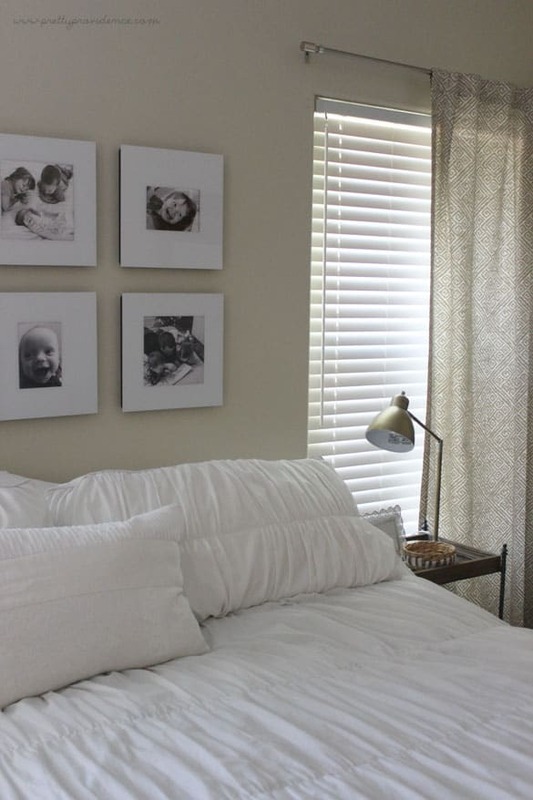 Would you ever use photo tiles to replace a headboard temporarily? If you liked this post you will probably love this post about how we redid all the cabinets in our house for under $200 or our awesome Ikea Hack Desk for under $60! Where did u get the frames? I just used command strips for the first time this weekend. I had a lightweight frame I was hanging (under 8 lbs) so I used two as they instructed. The frame fell. Not a big deal as it didn’t break so i used 4 on the back thinking if u added more support it would help. Nope. About gou hours later it came down and unfortunately broke the glass this time!! Major bummer. Do you have any recommendations for using the command strips? Is there a trick I am missing??? Thanks for your help! Wow Lauren I am completely shocked! Every frame in my house is hung with command strips and some of them are pretty hefty! Plus, I usually use less strips than they say, to save a buck, haha. The only thing I can think of is that maybe the surface you are using is not an approved one? Are your walls super textured or something?! Ugh no!! They are just a regular painted wall!! Maybe they were dusty? Next time, I will wipe them down. The mirror I hung in the kitchen is still on the wall….Good thing the picture frame was $3 from the Goodwill ;) THANK YOU for your reply! You are so welcome! Maybe run your finger along the strip to press it into the wall firmly before you push the frame into it?! I just want you to experience the joy like I have! Haha. This turned out so amazing! 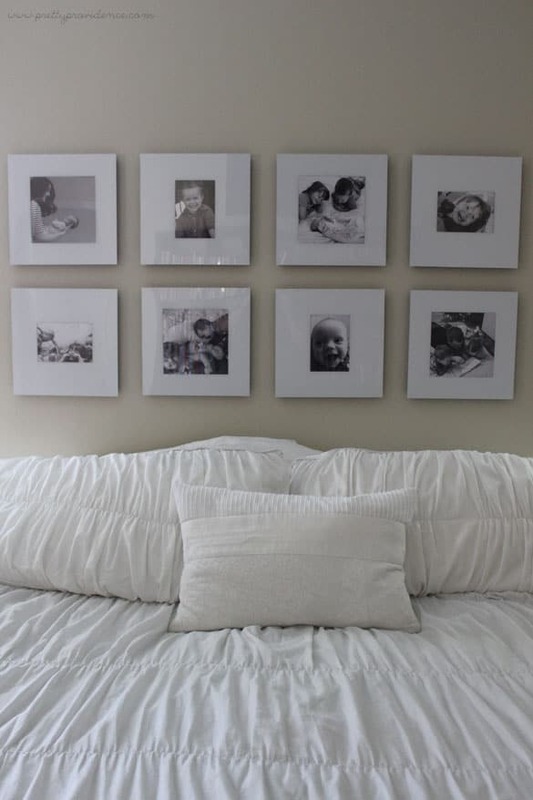 I need to order some of those frames asap – I have a few walls desperate in need of something! Thanks! You will love them! Seriously I already want to order more! Jess your room looks amazing! 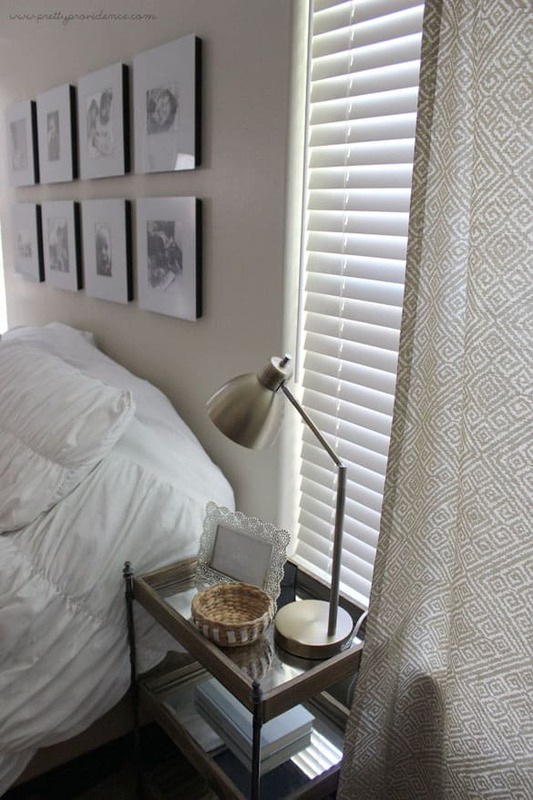 Honestly, I don’t know what I love most….the photo frames, the curtains, the lamps or the end tables. I’m obsessed with all of them! Thanks for amazing inspiration!! Aww you are the sweetest! Thanks for making my night!! GORGEOUS! I love those tiles, for real.